After Emily launched Woolworks she posted the infamous review. It still still shows up regularly when someone Googles for me. Like the rest of you, I do not have a lot of spare time. I had been thinking about updating this review for several years. 23 Feb 07 I cleaned closets. 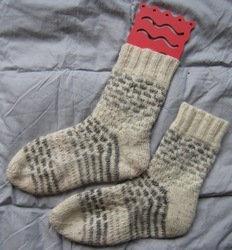 And in doing so, located a number of the socks from the review. A few are now orphans. I think I can even put my hands on a 1995-6 picture of a number of the socks. So I thought you might appreciate an update, 2007 style: on the web, complete with links and pictures. But first, the Ultimate Socks! Ruth, please take a bow! Having only talked to each other over email, I received a package in the mail from California. Opening it I found four colors of extremely fine, plyed yarn. There was plenty of white, and a lesser amount of three natural greys. They called out “socks!” to me, and I made up a pattern, kntting the sock with a dutch heel and a star toe. Since then they have been worn every winter. I took them with me to the field: to Grafenwoehr March 1998 when it snowed during our preparations for Bosnia, to Norway in 2000, on a winter exercise to keep my toes warm in the evenings and to the US multiple times. They have been primarily hand washed and hung to dry, dozens of times. After completing another pair of socks thought that I would post a summary to all of you. Mid range of colors – again feels a little more plasticky than some of the others, but my demin lace ones (the girly girl socks from that Spinnoff issue) are great. At 2.95-4.25DM/50 gm the best buy around. Not impressed – great bright colors, but the yarn did not feel as substantial, and it split. Did not hold up in the kids’ heels without the extra strand and I got complaints about stiffness with it. Got some great colors. It splits, badly. nice feeling yarn, but the splitting was a real pain. Will give you a follow up in a couple of months about how it wears. Have also looked at the Socka Cotton. Knitted up, it looked more like sweatsocks. I have some of Junghans cotton to try – but I really like wool socks. Best all around so far? Large amount of clapping for Ruth please!